South Siam 4 runs twice weekly 3 day / 2 night trips including Similan Islands, Koh Bon, Koh Tachai, Surin islands and also diving at Richelieu Rock. You can also make a longer trip by starting on the right day (ask us for details - see prices below). The boats are low budget options and offer a rare opportunity for a short 3 day trip that includes the magnificent Richelieu Rock. 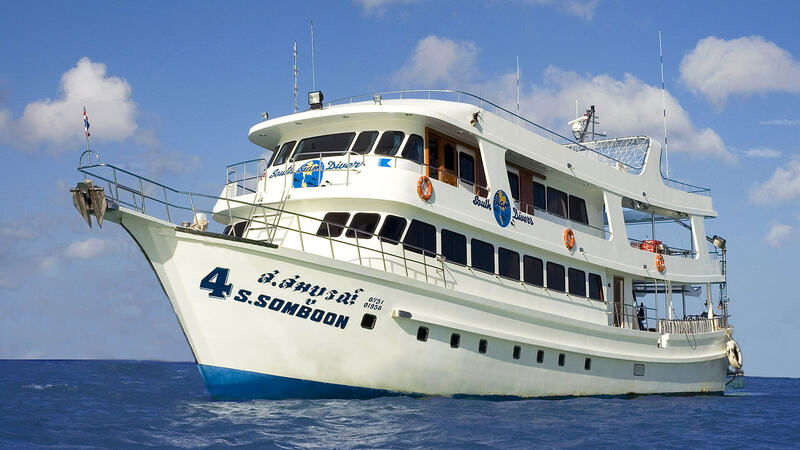 Overnight trips also possible starting most days to the Similan Islands and Koh Bon. Overnight trips do not include Richelieu Rock. You can start and end trips almost any day during the season (late October - early May), but for the 3 day trips including dives at Richelieu and Surin islands you must start on Saturday or Tuesday (South Siam 4) or Wednesdays or Sundays (South Siam 3). The South Siam 4 and South Siam 3 boats are built to almost the same design, sleeping 28 guests maximum. The boats can be crowded as there may also be day trippers on board. 1 night trips include Koh Bon if starting Tuesday or Saturday. 3 day/2 night trips to Similan, Koh Bon, Tachai and Richelieu start Tuesday, Wednesday, Saturday or Sunday. 3 day/2 night trips to Similan and Koh Bon (not Tachai or Richelieu) possible starting Thursday or Friday 18,900 Baht. 4 day/3 night trips to Similan, Koh Bon, Tachai and Richelieu start any day except Thursday. 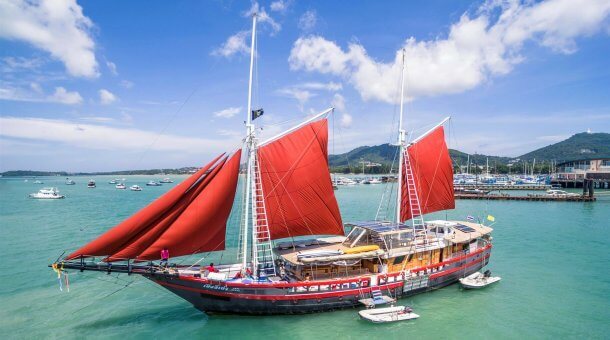 The South Siam 4 and South Siam 3 are lower budget liveaboards and accommodate a maximum 28 guests sleeping in twin or double air-conditioned cabins, with 6 shared bathrooms. 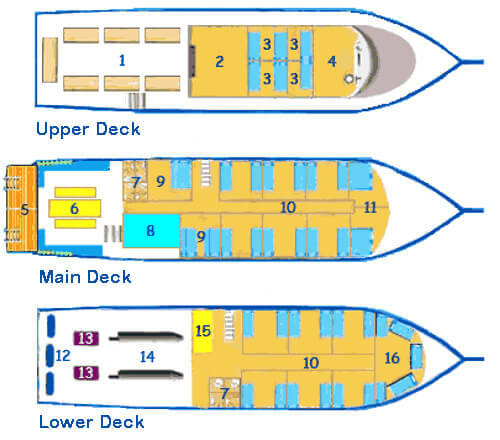 On the upper deck you find a large shaded outdoor seating area where large meals are served to hungry divers, plus an indoor air-conditioned lounge equipped with TV and DVD. On the very top deck of the South Siam is a large sundeck. South Siam is a good choice for a lower budget, short trip that includes all the dive sites normally visited by trips of 4 – 5 days. Great if you have a short time but want to see as much as possible. With trips as short as 3 days / 2 nights including the Similans, Koh Bon, Koh Tachai and Richelieu Rock there’s a great variety of diving in a short period. or you can just do an overnight trip with 7 dives, ideal for a weekend! Note that this boat unlike most other liveaboards, does not provide towels, please bring a towel with you. All trips on the South Siam 4 or South Siam 3 start very early – pick up time in Phuket is between 6 – 6:30am. Guests are transferred by minibus to the port of Thap Lamu, around 2 hours drive from our home at Karon Beach. Breakfast is available at the port on departure day before boarding the speedboat, usually just some toast and coffee, you may want to bring something with you to eat on the minibus ride. At the port you transfer to the speedboat for a 90 minute dash to the Similan Islands to join the dive boat. On your final day you will make 3 dives in Similan, and expect to be back in Phuket by 6 – 7pm. Transfers from / to Khao Lak hotels are also possible and indeed recommended to avoid the 2 hours each-way transfer from/to Phuket. NOTE that at busy times the boat is likely to be crowded and note that day trippers can join some days too. You have 28 guests sleeping on the boat, plus new divers arriving and on changeover days there can sometimes be 50+ divers. The boat is well run, but some people may find it a little too busy. If you want a quiet boat with less divers, this is not the one for you. Divers booking on the South Siam boats should have Advanced Open Water certification or Open Water with at least 20-30 dives and have dived in the last year. Divers with less experience or who have not dived for a long time may be able to join, but need to pay extra for a private divemaster. All divemasters on the boat are working for the boat – we send private guides if divers are less experienced or on request (2000 Baht per day). Overnight trips can start on Monday, Tuesday, Thursday, Friday or Saturday. 3 day / 2 night trips can start Tuesday, Wednesday, Saturday or Sunday. 4 day / 3 nights you can start any day except Thursday. 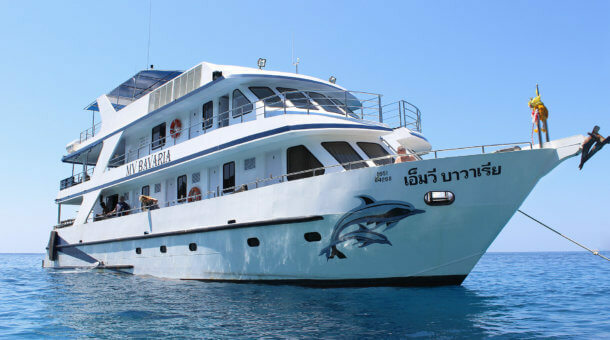 Rental equipment is provided by Sunrise Divers for our divers on the South Siam liveaboard. Rental price is 500 Baht per day for a set (BCD/regulator/fins/mask/wetsuit) and 250 Baht per day for a dive computer. We have a large equipment room at our dive center with 30 sets of Aqualung BCDs and regulators and a large selection of long and short wetsuits, open heel and full foot fins. If you need to rent equipment we suggest you meet at our dive center at least 1 day before departure day, so you can try all equipment before departure. We can’t arrange on departure day because these trips have early morning pick up starting 6am, so all equipment is prepared the day before. If not possible to meet at our shop, no problem, we will pack extra equipment in different sizes. Torches for night dives, no charge. 15 liter tanks available 300 Baht per day. Nitrox is not blended on the boat, but if you want to use Nitrox you can order in advance, price 300 Baht per 12 liter fill. Tanks have to be carried to the boat from the mainland by speedboat. PADI Advanced Open Water course is 8,500 Baht. PADI Enriched Air (Nitrox) course is 8,500 Baht. Drinking water, coffee, tea and sodas are included. Beers are 50 Baht. We have included below a typical itinerary for a 3 day/2 night trip. You can also do 2 day/1 night, 4 day/3 night or even longer stays on the South Siam boats. Note : This is an approximate itinerary. The 2 night trips include 11 dives at the Similan Islands, Koh Bon, Koh Tachai and Richelieu Rock. Exact dive times will vary from day to day. *Pick up free from Chalong, Kata, Karon, Patong in Phuket or beaches in the south of Khao Lak. Other areas have a fee of about 500 Baht per person for transfer. Please check with us if your hotel is in a free pick up area and be sure you are aware of extra fees before booking.